Um, really? How is Thanksgiving just two and a half weeks away? It seems just like yesterday I was celebrating Easter by making these cool tye-dyed eggs. But the fact is IT is just a couple of weeks away! To help you get ready I will be celebrating Thanksgiving all this week on Kitchen Concoctions. I will share some useful recipes and tips to hep give you some T-day inspiration! First up is an article I wrote for meal planning/recipe site Food on the Table, about hosting Thanksgiving on a budget. 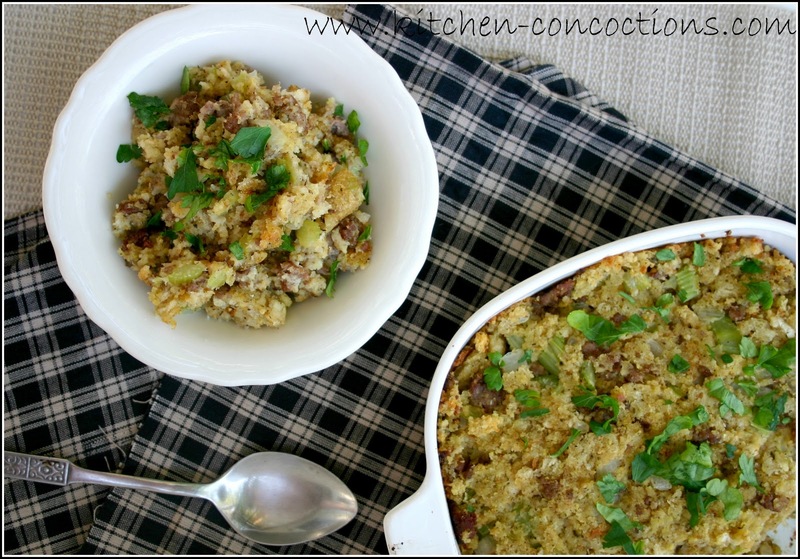 I have also included a tasty and easy stuffing recipe (really you would never know this was doctored packaged stuffing mix) that would be perfect for Thanksgiving or any chicken or pork dish on a busy weeknight! It may be hard to believe that Halloween has come and gone, but the fact is Thanksgiving is just a few weeks away! Hosting Thanksgiving dinner for a hungry crowd may seem like a daunting and budget breaking task, but with proper preparation and a few helpful tips, Thanksgiving dinner will be a feast to remember. · Plan early- Three weeks before Thanksgiving plan your menu. Gather the recipes you will be using and take an inventory of your pantry. Keep a running list of ingredients needed and watch for them to go on sale. Keep things simple and stick with tried and true traditional dishes. To help reduce costs, consider making assignments to dinner guests to bring beverages, side dishes and desserts. · Shop smart- Many stores giveaway turkeys or hams during the weeks leading up to Thanksgiving. These free promotions usually involve spending a set amount on other groceries; so plan appropriately and shop for all your groceries at one time. Plan to shop for groceries 5-7 days prior to Thanksgiving, when most stores run sales on popular Thanksgiving foods. Shopping early also ensures the stores are fully stocked. To help reduce your shopping bill even more, keep an eye out for coupons that match sale items and consider preparing dishes from scratch and that use fresh, seasonal produce. · Decorate with nature- Make beautiful, inexpensive centerpieces by using leaves, pinecones, and acorns to fill baskets and bowls you have on hand. Allow children to color pictures of turkeys or cornucopias to use as placemats. Avoid pricy paper goods and use dishes from home instead. · Make memories and give thanks. Keep in mind that while Thanksgiving centers around a big dinner, it is really about giving thanks and showing love and appreciation for family, friends, and the blessings in our lives. Keeping this in mind, will guarantee a wonderful Thanksgiving gathering to be remembered! Looking for a flavorful Thanksgiving side that won’t break the bank? 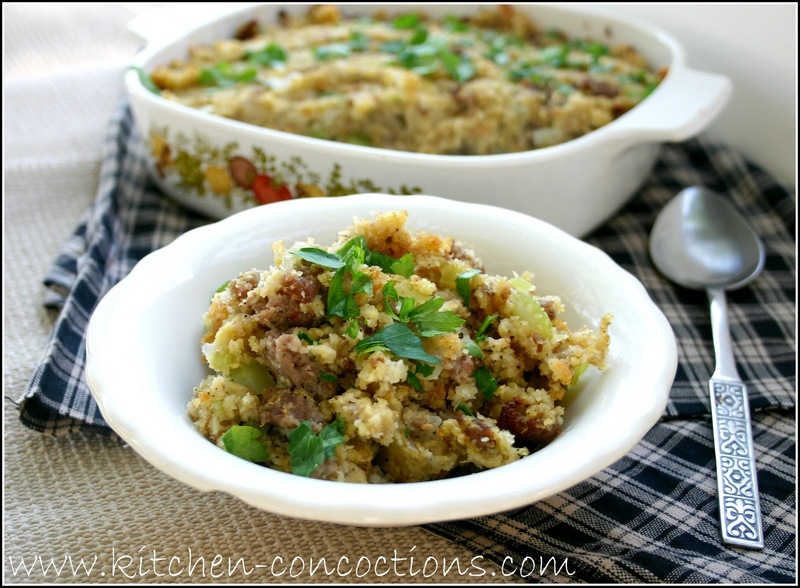 Try this easy and delicious recipe for Easy Sausage Stuffing! In a large skillet over medium heat, crumble sausage. Add onion, celery, and garlic. Cook, stirring occasionally until sausage is brown. In a large bowl, place cubed stuffing. Add sausage mixture. Sprinkle with poultry seasoning. Pour broth and butter over the mixture. Bake in 350 degree oven for 15-20 minutes, or until golden brown.